Mel Ziegler: Activated Artifacts - Number: Inc.
1000 Portraits, 2018, Courtesy of the Artist and AAP Cornell. Photographer: William Staffeld. Sitting in Mel Ziegler’s studio, I see a display case filled with his collection of mass-produced souvenirs mixed with a bounty of rocks, sticks, and other natural wonders he has collected. It sits as a kind of reliquary for sentimental objects that inform his practice. The assemblage reflects Ziegler’s commitment to making art that highlights human interaction with nature and his use of found objects to initiate conversation. 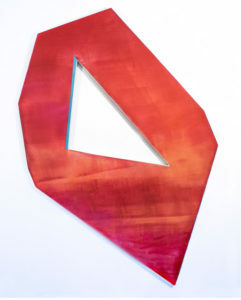 A professor at Vanderbilt for 12 years and founder of The Sandhills Institute in Rushville, Nebraska, Ziegler also maintains an active international career as an artist. We begin our conversation about relics with a work, Flag Exchange, which he first exhibited in 2016 at Tang Teaching Museum and continues to show around the country. 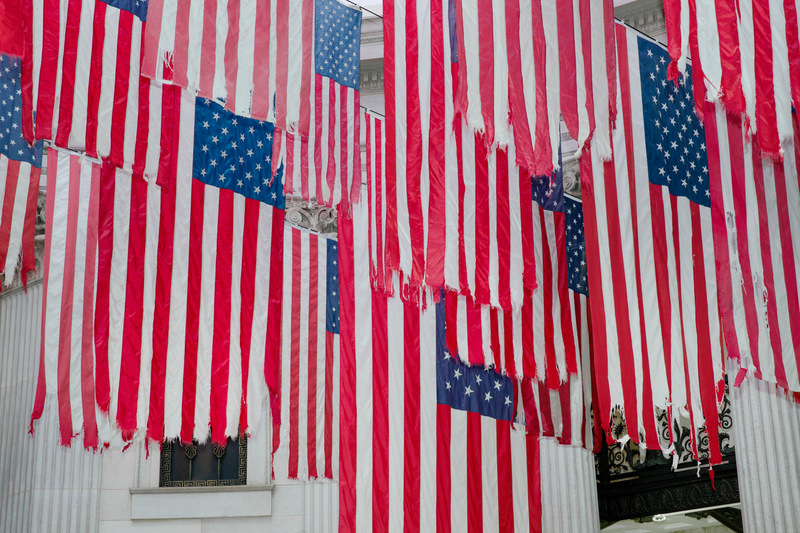 In this work he honors 50 American flags that through natural decay have become tattered remnants of what he notes were once living things. Why did you decide to install the remains of American flags in Flag Exchange? It had to happen. In and of themselves they are beautiful objects. Multiply that times fifty and it is magic. They seem to capture their moment of “glory” with their own demise. Being weathered, they almost developed a second life and at the same time felt enchanted. According to the Flag Code, which explains all laws regarding the American flag, they are to be treated as literally alive. Yes, the U.S. flag has laws that dictate use and retirement. Typically, distressed flags are put to rest through burial, flame, or other methods that make it disappear. Why are you interested in preserving them? Relics inadvertently record their own history. There is a sense here within these flags of what I call meaningful entropy. 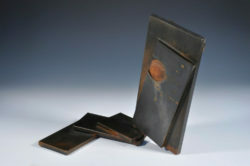 That entropy creates a patina with significance and meaning. My late partner, Kate, and I often used antiques in our work for that exact reason. The weathered flags act very much in the same way. They are records of time, place, and politics. It is good that we renew and regenerate weathered flags. It is a necessary and healthy ritual. But for Flag Exchange I wanted to hold that moment. Elevate the weathered flag with reverence as a historic relic of a particular time, place and social history. It gives us a moment of pause. Allows us to investigate, appreciate and maybe challenge. These flags carry the poignant pathos of time served that is evidenced and recorded in their inevitable demise. Capturing them in this moment is what regenerates them, gives them new meaning, new life. What attracted you to opening a discussion around the American flag in Flag Exchange? Well, I would like to say it started with the political condition in which we find ourselves currently but actually this project started six or seven years ago. The project has become more necessary and poignant over time and in the current political climate. I originally was interested in every weathered flag I could find. It wasn’t until I realized I wanted to make an actual physical work with them other than an act of exchange that I honed in on the 50 states as a conceptual framework. The flag is a loaded icon, and I have never shied away from such controversy. I wasn’t trying to be disrespectful or irreverent to the flag itself. I see these things as trophies full of their individual history of display and time. How did people react when you approached them to retire their flags? Some people were happy to exchange the flags, some people were embarrassed, some were indignant and others didn’t seem to care one way or another. They often thought there was a gimmick…that somehow I would send them a bill. I don’t know why, but I didn’t have any refusals till about the 25th flag or so. Then I had a whole slew of them, but that usually led me to something more interesting. Did you preserve memories of your encounters? Yes, every encounter was written down in a very straightforward recording of the exchange. I didn’t plan to make it part of the work because I didn’t want to feel like somehow I was taking advantage of each situation, but everyone wanted me to release the stories. I do not use names or locations. I just list the state. What has been the response to this work? Have you been surprised? Every time I show this work I get nervous. Thinking that people will read it as a negative thing. But that really hasn’t happened. I guess that pleasantly surprises me. I learned at an early age that when working with community the last thing you want to do is make your audience or participants angry. Anger stops all dialogues and discussions. Which is ultimately what I am after. When I first showed a part of it at the Bemis in Omaha there was one veteran who challenged my intent. After I explained it further he seemed alright with the project. I also collaborate with each institution to create dialogue around the project through programming. I think this helps immensely. Do the various venues where you have installed Flag Exchange contribute to the works’ significance? Yes! Each and every place it is installed is different. And yes, as I said earlier, I try and collaborate on programming for the exhibition. It also just looks different in each location. I will say that as for differences the Tang did an excellent job with community programming that included the city as well as the college students and professors. San Francisco Art Institute engaged students and classes. When it was shown at Federal Hall it pretty much stood on its own in relation to the architecture and history of the place. Visually, it is still my favorite of the venues in which it was shown. It was so dramatic located in the dome. It’s as if that was its home all along. I read you recently completed an installation and keynote address at Cornell University. The Atkinson Forum on American Studies conference you participated in was themed Place, Memory, and the Public Monument. 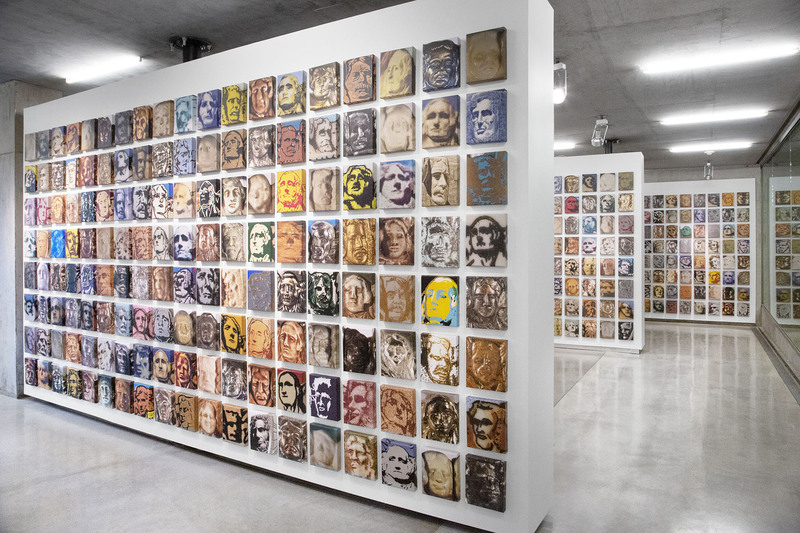 Your work, 1000 Portraits, features an array of 8” x 10” painted reproductions of the presidents I recognize from the Mount Rushmore souvenirs in your curio. 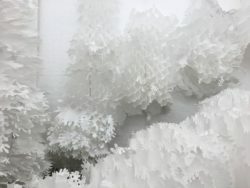 What is the connection between these objects and the finished installation at Cornell? Over the last 15 years I have been collecting vintage Mount Rushmore souvenirs. It is important that they are vintage, that they were bought by a visitor to the monument as part of their experience there. These objects are imbued with a personal story and a social history. To me that elevates the object beyond kitsch: it is an “activated artifact” that I believe a relic is by definition. It has a social history attached to it and that is what interests me about the communal objects I work with. 1000 Portraits is based on photographic images pulled from my collection of these vintage souvenirs. Each of the 1000 images is unique. It was my idea that these portraits no longer represented the four presidents, but rather it becomes a crowd representing a group of diverse people flipping the notion of the “Shrine of Democracy” on its head. Flag Exchange in Federal Hall New York City, 2018. Courtesy of the Artist and Perrotin photographer Guillaume Ziccarelli. Given your work and history of ideas it must have been fascinating to respond to something so familiar. What did you learn while working with these concepts in mind? I was honored to be part of this conference. There were some amazing heavy weights like Edward Ayers and Erika Doss who participated in the two-day event. The focus was more or less on problematic monuments. Most importantly, I learned the necessity to have open and inclusive dialogue. Decisions about removing civic and public monuments that offend us should not simply be removed by elected officials. It needs to be a democratic process and decisions, one way or another, should be based on that public dialogue. Many of your artworks involve conversations with communities and individuals. Why is it important to the final art you install? In general I don’t actually make things…I respond to them. I manipulate them or mostly re-present them. I particularly enjoy things…objects…relics, if you may, that carry with them a social history. They contain pathos and stories. They are objects with human experience embedded in their very nature. So, my interest in these things is because they carry with it meaning that goes beyond the object itself. They are alive. When I collect things like the flags I like attaching the stories to them. Conversation gives me those stories. They are mine. They are personal between two people. It’s what makes them unique. Do you attach stories to objects outside of your art making? Not many people know this, but I’m the type of person that talks to my things. When I leave my ranch in Nebraska I always say goodbye to my equipment, to my barn, to my house and to my land. When my tractor does a good job in the field I always praise it for a job well done. I actually pat it affectionately like I might my dog. I just traded in my truck that I had for three years, and we had traveled over 90,000 miles together. I had a long goodbye and thank you with it. I think there was even a hug. 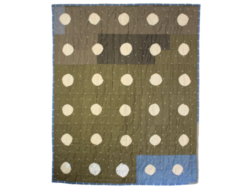 Sara Lee Burd writes about art from Nashville, TN.